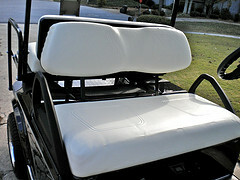 A golf cart seat cover can give a custom look to any golf cart or make an older cart look like new. 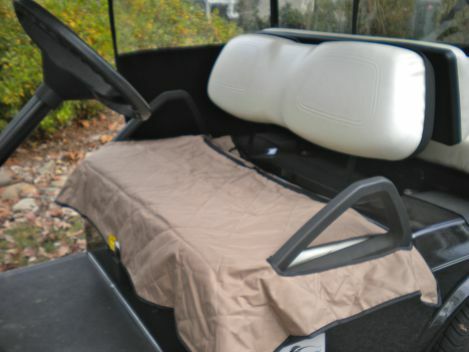 Some people like to put covers over their existing golf cart seats to protect them from being damaged or place new ones over a damaged golf cart seat to give it a fresh or custom look. 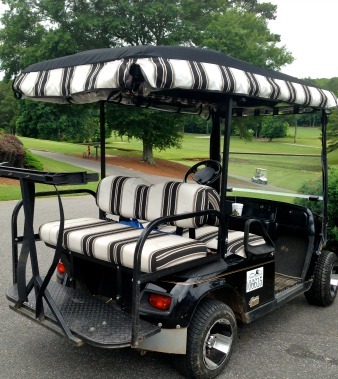 A golf cart seat cover comes in an assortment of colors and styles from solid colors to stripes. Seat cover fabrics include synthetic sheep skin, vinyl, terry cloth or durable Sunbrella outdoor fabric. 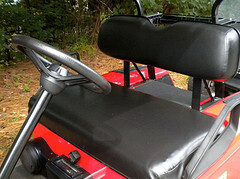 New seat golf cart seat covers can make a tired and worn golf cart look like new. Ready made seat covers have elastic binding and an under seat strap. These covers slip right over your vinyl seats. They offer a nice tight fit - kind of like the bottom sheets on your bed. 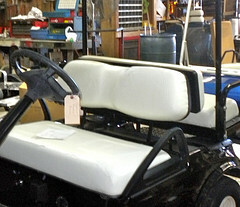 You will need to know the make, model and year of your golf cart. There are several different types of fabrics or color schemes to choose from. 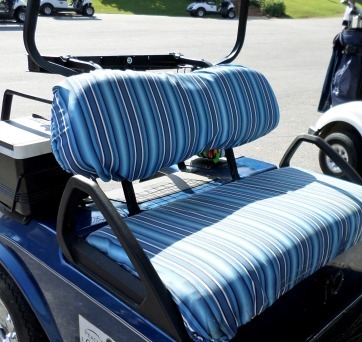 √ Sunbrella Golf Cart Seat Covers - made of stain, fade and UV-resistant fabric. Also machine washable. Comes in solid colors or stripes. The two pieces include one for the bench seat and one for the back rest. Elastic hems and strap systems provides a custom-like fit. Pay attention to the type of back rest. Most of them are for a single bench style back rest. These covers are easy to put on over your existing seat cover. This cover is universal and because of it's stretchy micro-fiber fabric it fits most two person bench seats. Elastic hems and straps make it easy to put over your existing seat and yet give a nice taught fit. For those hot summer days, you will find that the diamond mesh weave actually allows the fabric to breath rather than trap the heat making it cooler to sit on. If your vinyl seat covers have developed tears or stains that make the golf cart look old and worn, you can re-cover your golf cart seats. Or maybe you just want to change the color or get a more custom look with a two toned pattern. Select the cover based on the make, model and year of your cart. The covers are easily installed. Some dealers instruct one to remove the old vinyl from the seat and place the new covers over the existing foam and staple gun the cover in place. Other manufacturers make replacement covers that fit right over the existing vinyl. Installation varies depending on which company you choose. √ Replacement Seat including foam, plywood and vinyl cover all ready to install. Most often the new seat covers are placed over the old worn ones. It saves a lot of time and still looks great. Check for seat covers that are mildew resistant with UV additives that protect against fading. The most common solid colors are white or buff. These covers are more specific to the make, model and year of your golf cart. You will need to know if your car model and year. If you are not changing the color of your seats and only need to replace the bottom you can just buy a bottom vinyl seat cover. Creating a custom seat cover allows you to choose any color combination you like. Lots of golf carts here in Peachtree City are red and black with Georgia Bulldog decals on the front. Whether you want your cover colors to reflect your favorite football team or other sports team, almost any color combination is possible. A Club Car golf cart cover can be purchased through your Club Car dealer or on line at places like Amazon. 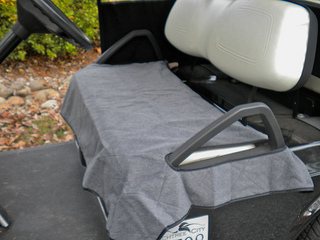 Keep your seats cool in the summer and warm in the winter with a golf cart seat blanket. Have you noticed how cold a vinyl seat can be when it's cold out and how sticky it is when it is hot? I was really surprised by what a difference this seat blanket made on a cold morning heading to the golf course. Likewise I love the cool feel of the cotton material on hot days. The seat cover fits right over the side arm rests so it doesn't move. Put the fleece side up for a soft, warm seat. The other side is a soft cotton/water repellent fabric. Use this side in the summer so you aren't sitting on sticky vinyl. I use mine year round. It can be washed in cold water, so don't worry about getting it dirty. Neighbors have asked me where I got mine and have promptly ordered one for themselves. For just a little more than $25 you can put on this seat cover that is two sided. One side is a gray fleece and the other a water repellant tan fabric. Slip the cover over the two hand rails and you've got a cover that can hide a dirty or ripped seat. Flip it to the fleece side and you get a nice warm blanket to sit on that's way more comfortable than vinyl on a cold day. 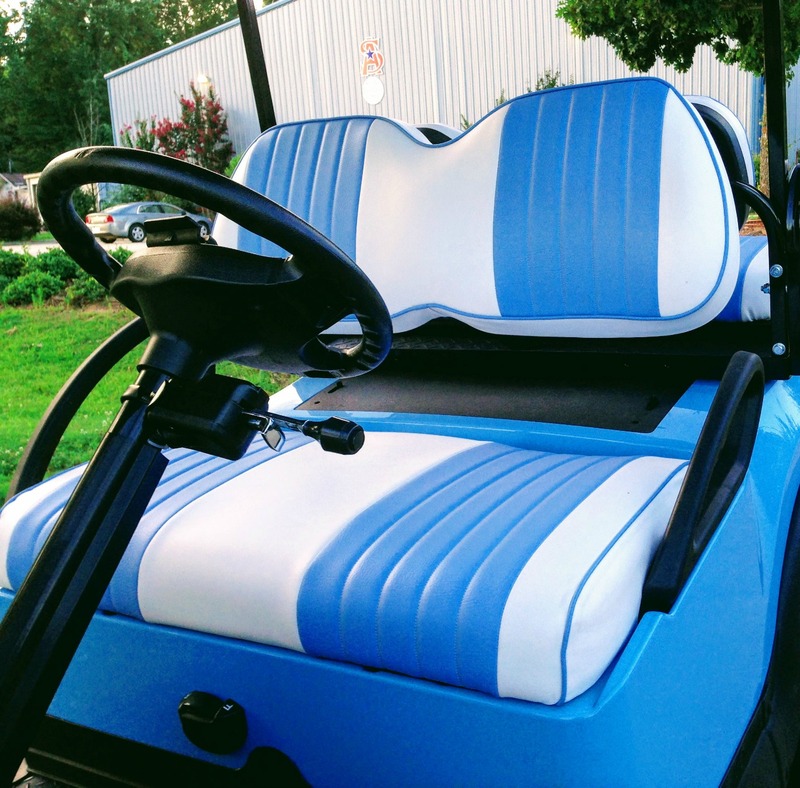 Seat covers can customize a golf cart or can give an old golf cart a new, refurbished look. There is sure to be a color and style in your price range that's right for you.